In the early times, Glen Allen was know as Stewart's Gap. The community later became Glen Allen, supposedly named after two engineers who worked with the railroad which was built through the town. Glen Allen is located in the far north end of Fayette County. A part of the present incorporation is located within Marion County. Lots of land were laid out in 1889 using the railroad as the center of business. The Kansas City, Memphis and Birmingham Railroad was built through the area in the early 1890's. Trains started their journey over the tracks in 1885 and the railroad later became the St. Louis - San Francisco Railroad Co., known locally as the Frisco. One of the first items shipped from Glen Allen was unsashed sand. William Henry Stewart operated a "sand pit" and shipped mortar sand by the carload. The cars were loaded with wheelbarrows and the men who loaded the cars were paid seventy-five cents per day. The railroad also shipped cross ties and the tie yard was located near the train depot. The ties were cut, measured and hewed by hand, using chopping axes, cross cut saws and broad axes. Glen Allen also had a saw mill which shipped lumber to shiping demands across the country. A head and stave mill was located south of town on Ford's Mountain, using the depot to ship their products as well. As time went on, coal became more and more important to shipping on the Frisco. In the 1890's a sassafras oil mill was in operation at Logan Spring. Sassafras roots were dug by grubbing hoe and carried to the mill to be chipped by a wheel that was powered by a small steam engine. As the wheel turned it chipped the roots with a narrow blade and the chips were then placed in a vat and heated to obtain the sassafras oil, which was in demand for medicinal purposes. Cotton gins were predominate throughout the area with most gins using Glen Allen Depot for shipping. Local boys would pack the cotton by tramping it with their feet, working for ten to fifteen cents per bale packed. Mr. Claude Aldridge testified that after the first two to three days of packing cotton for shipping, he would have a high fever, a sore throat and a stuffy nose all from coming in contact with the cotton. Mr. D. M. Patterson operated a mule-pulled cotton gin, thought to be the first in Glen Allen. Mr. Joe Guin, who was depot agent at Glen Allen in 1914, says that the three items shipped most that year were cotton seed, cotton and lumber. Some of these items were hauled to the depot from Rock City and other nearby communities. The Glen Allen Post Office dates from as early as 1877. Mrs. Roy Aldridge had in her possession a letter which was stamped at Glen Allen and dated 1877. Mr. Barney Bishop is believed to be Glen Allen's earliest postmaster. Others who served as early postmasters included Mr. J. L. Lee and Mr. Jesse Adkin. Both of these gentlemen served as postmasters while operating a general store. In 1914 Mr. Adkin assumed responsibility for the telephone switchboard which served the homes in the area. The Patterson Hotel, which was built in early 1895, served as a place of busy activity over the years. Much good food was served to those working in the area. Often men would hire a hack and drive for miles to enjoy the good food and atmosphere of the Patterson. If possible, they would even rent a room to spend the night. Railroad men availed themselves of the delicious food at every opportunity, including train passengers. The cost for a complete meal was twenty-five cents. The food was placed on the table and everyone was invited to "help yourself." Each guest ate all the food they wanted. Passengers on the "Plug," which was a local train, would always buy food from the hotel. In the event time was short, a member of the "Plug" crew would call ahead to place orders for the passengers and crew. Someone from the Patterson would be waiting when the train pulled into the depot. The food was brought in baskets and they were sold for twenty-five cents each. Mr. Joe Guin, who resided for a short period of time at the Patterson, once stated that the baskets were packed full of food - "good food too." The Patterson still stands today and is owned by Mr. Boyd Pate. The Ray McCaleb family previously owned the property. Mr. James B. Smith, Mr. J. L. Lee, Mr. Anderson Lee, Mr. Tommy Caddell, Mr. Jesse Adkin, Mr. W. M. Logan, and Mr. Dave Tidwell were among the first store operators in the early ears. Two drug stores served the surrounding area. Dr. Harry McCleanachan, Dr. R. L. Hill and Dr. Bill Cochran were supporters of these community drug stores. Other past physicians who have lived and had offices located in Glen Allen include Drs. J. C. Johnson and Linwood Earnest. The grist mill was an important part of community life. Wheat was once ground for local people, but corn was ground in Glen Allen until the early 70's. The first one room school house was built by Mr. John LeFoy. Enrollment grew over the years, requiring additions to be added with the school growing to the point of teaching eleventh grade at one time. The upgraded building burned in the early 1920's and another building was then located at a site just north of old St. Hwy. 78 (present St. Hwy. 129) and it burned to the ground in 1946. The Methodist Church was organized by a group of worshippers who had previously worshipped at Camp Ground, located about a mile east of the town limits. A wedding was registered in the church records by the Rev. J. B. Smith in February, 1896. When the Bankhead Highway (St. Hwy. 78) was rebuilt, the original building was removed to make way for the new roadway and the present building was erected. The building was moved to the Hubbertville community and utilized by the Hubbertville Church of Christ congregation. 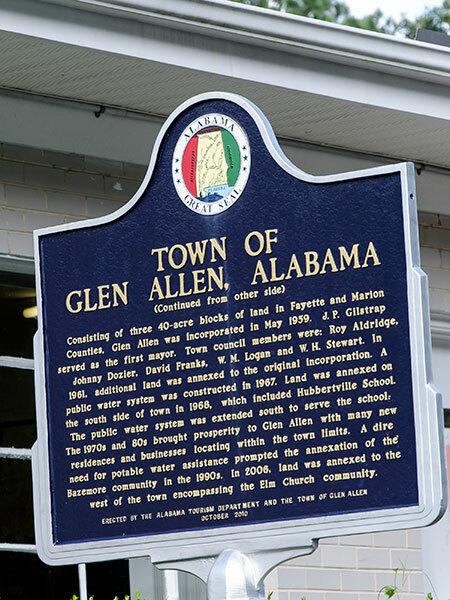 The town of Glen Allen was incorporated in May, 1959, containing three forty-acre blocks of land. Mr. J. P. gilstrap served as first mayor, and his council members were Mr. Roy Aldridge, Mr. W. M. Logan, Mr. W. H. Stewart, Mr. Johnny Dozier and Mr. David Franks. In 1961 other forties of land were annexed to the original three forties of incorporation. In 1962, Mr. Nash Nelson was elected mayor and he had the vision of constructing a public water system which only consisted of three miles. He pursued annexation for town growth and was successful in his vision with landowners agreeing to annex property located south of the existing town limits. This annexation brought Hubbertville School into the town limits. Along with the new annexation, 1968 brought an extension of the town's water system to serve residents living in the Hubbertville community. Working with Mayor Nelson on these important building blocks for the town were council members: Mr. W. H. Stewart, Mr. Joe Stewart, Mr. W. E. Patterson, Mr. P. A. Hollingsworth and Mr. Caldwell Hollingsworth. Also in 1961 additional land was annexed to the original three forties of incorporation. A public water system consisting of a town well and three miles of water lines was constructed in 1967. Land was annexed on the south side of town in 1968, which included Hubbertville School, and the public water system was extended south to serve the school. 1970 through 1980 brought prosperity to Glen Allen with many new residences and businesses locating within the town limits. With a dire need for potable water assistance, the 1990's brought additional annexation with residents of the Bazemore community annexing property. In 2006, land was annexed to the west encompassing the Elm Church community providing much needed potable water to serve those residents. (The above information was taken from articles published in the Fayette County Sesquicentennial (Submitted by Mrs. Bealon S. Nelson).